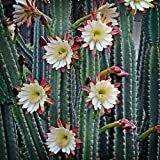 Cereus peruvianus growing cactus of the genus Cereus also known as Cereus repandus, Cereus peruvianus perennial plant also used as ornamental plant, grow in desert, mediterranean or subtropical climate and growing in hardiness zone 9-12. Small Cactus Plant. Cereus Peruvianus Montrose 'Camelot'. A unique shaped cactus with gold spines. What can be done with big quantities of Cereus peruvianus fruit?